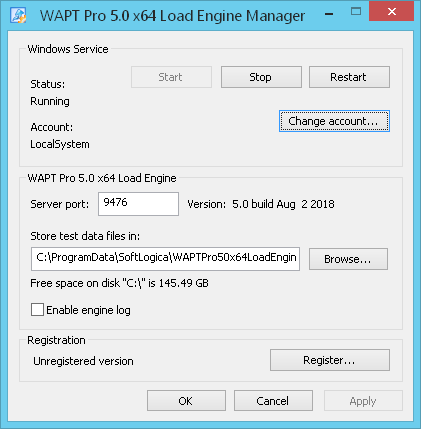 The x64 Load Engine is a special WAPT Pro load agent for Windows 64-bit systems. During the installation you specify the settings for its setup and correct work. If you need to change these settings later, use the x64 Load Engine Manager. On the Windows Start menu, choose SoftLogica in the list of currently installed programs and select WAPT Pro 5.0 x64 Load Engine Manager. Status: Here you can view the current state of x64 Load Engine service and also manage its state using the Start, Stop or Restart buttons. Account: Click the Change account... button to change the account for the x64 Load Engine service. Server port: The communication between WAPT Pro and x64 Load Engine is performed over TCP/IP. The x64 Load Engine requires one TCP/IP port on the system to listen to WAPT Pro. Port number 9475 is used by default. Here you can also see the version of currently running x64 Load Engine service. Store test data files in: Here you can change the default location for users' logs (saved on the computer running x64 Load Engine) and also various files required during test runs (for example, SSL certificate, file for $LOrder function and others). Enable engine log: This option allows generating a log file which contains information about the work of x64 Load Engine. The name of log file is x64LoadEngine#9475.log (9475 is the specified port number). It is saved on the computer running x64 Load Engine in the same folder with the users' logs (this folder is defined by the previous option Store test data files in). Note that any changes made in the x64 Load Engine Manager will be applied only after you restart the engine service (click the Restart button). Registration: In the unregistered version of x64 Load Engine, the maximum number of virtual users is limited to 20. This limitation is removed when you register the product. Click the Register... button to register the x64 Load Engine.